Pebble Beach, Monterey, Carmel Valley and Big Sur California. 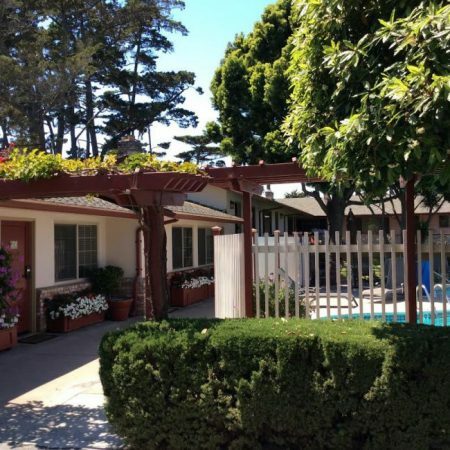 Whether you are coming to Carmel for romance, family vacation with children and a pet, or with an organization call 831-372-5000 for reservations made specially with your ideals in mind. You will receive the best room rates and hotel availability and your reservation will be booked for you in a jiffy! It is essential to make your room request well in advance of arrival. Free local reservation service gets you into the best jacuzzi and fireplace rooms, family friendly suites and pet rooms with your beloved doggie, while the best selection of rooms is still available. This cheerful inn is located in the heart of the Carmel Village within easy walking distance of shops, artist studios and restaurants of many fine cuisines. The building was built by Lars Svendsgaard around the mid 1950’s and offers ranch-style architecture built around a garden courtyard with small heated pool. The inn is well located with places to walk the dog too including a forest and the nearby pet friendly beach all walking distance of the inn. Quaintly decorated rooms have king bed, queen bed and queen with twin bed are available for individual, couple and family guests. Suites have queen-size sofabeds in living areas with queen bed in bedroom. There is a two room king bed suite with additional king size bed in two separate sleeping room. Deluxe rooms and suites have a fireplace and full bath and some have jacuzzi tubs. There are rooms which are designated as pet friendly as well, so there is plenty of room for everyone in the party! All rooms have refrigerator, coffee maker, and iron. Complimentary continental breakfast and newspaper are delivered to your door every morning. So you will have relaxed mornings during your stay! Think of the Svendsgaard’s Inn for a nice stay in Carmel village shops and restaurant area during your next group event with a booking by local Carmel Area Reservations Service at 831-372-5000. Receive great room rate quote on a block of rooms during your wedding, anniversary, reunion and group meeting and special event. Get free event planning service to help with arranging your upcoming event. Then you’ll be able to relax and enjoy the anticipation of your sure to be fabulous event in Carmel! ©2019 Carmel Area Reservation Service. All rights reserved.